Laser scanning has created an exciting opportunity for the sharing of information on archeological artifacts. Using technology borrowed from land surveying, laboratory scanners measure distances and directions to a dense grid of points on the surface of a scanned object, establishing precise 3-D coordinates for each such point. This results in a three-dimensional high-resolution digital model. The resulting point cloud may be viewed in three dimensions, much as the physical object itself may be viewed. The model may be viewed from any perspective, and precise measurements made of the object. Further, that model can be shared, via the internet, to allow other researchers anywhere in the world to examine and study the artifact, much as can be done with the physical item itself. As a result, leading museums, such as the Smithsonian Institute, are making high-resolution scans of their entire collections, creating virtual museums, open to the world. 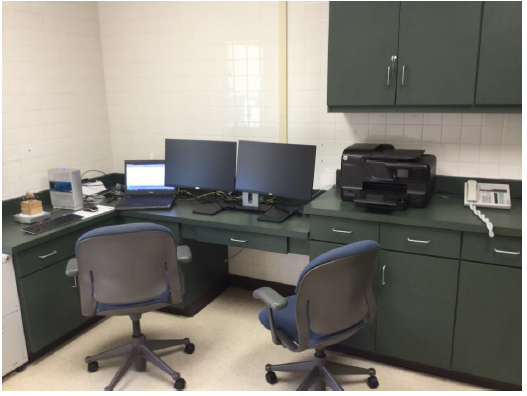 ​To allow the Aucilla Research Institute (ARI) to take advantage of this technology for the advancement of science, the Louise H. and David S. Ingalls Foundation provided a grant for the purchase of equipment and setting up of a scanning lab. The lab is set up in a two-room suite in the Gerry Building in Monticello, Florida. 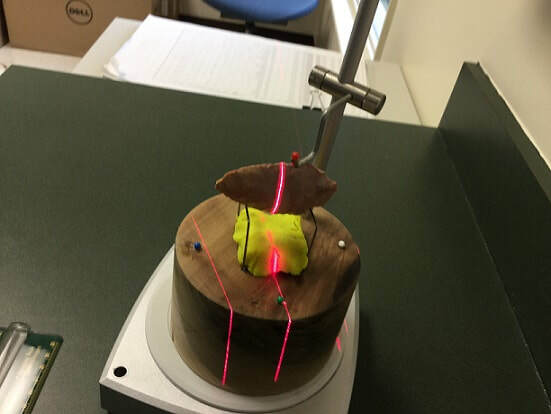 The lab currently is equipped with a high-resolution laser scanner along with an advanced computer system and associated software (Figure 1). The heart of the scanning lab is a Next Engine scanner. That device “paints” the object being scanned with four bands of an infrared laser (Figure 2) to measure distances and angles and create an amazingly dense image of 67,000 points per square inch. The associated Scan Studio software controls the scanning as well as the alignment and editing of the images. The software operates on a high-level Dell computer complete with dual monitors. Items being scanned by the system are placed on a turntable which automatically rotates. This allows the subject to be scanned from several perspectives, creating a three-dimension point cloud from each perspective. A digital photograph is also taken from each perspective to provide color for each scanned point. After scanning, point clouds from each perspective must then be aligned to create a coherent digital model of the subject. A custom artifact holder is used that not only supports the object while it is being scanned, but also provides several miniature surveying targets that can facilitate the alignment process. There is a considerable art to the entire scanning process. In addition to the painstaking alignment process, scans must be fused into a consolidated model and then carefully edited to remove images of the supporting structure or background noise. While a typical eight-position scan takes about an hour, the alignment and editing process takes considerable more time. 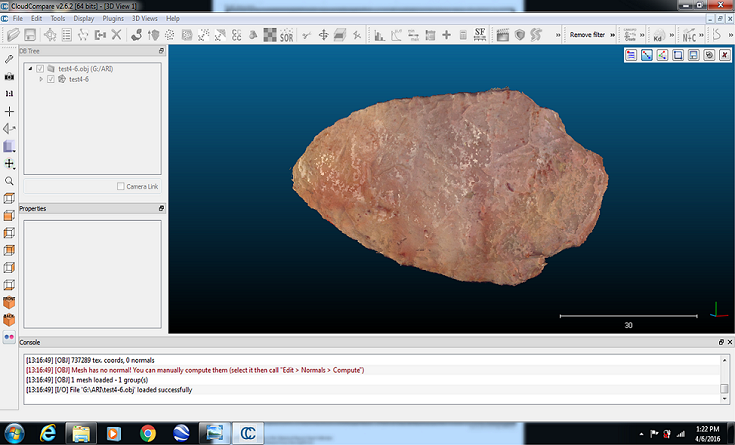 The completed scans are typically downloaded to an OBJ file which may be viewed and analyzed using various observing software (Figure 3). A typical digital model of a small object is about 100 megabytes in size. Therefore, a key component of the system is high-capacity offline storage for the models. The scanning lab will allow the ARI to provide scanning services for archeological researcher from various universities working in the Florida area. That resource will be an attractive featurefor such researchers, allowing them to immediately document their findings and share them withcolleagues anywhere in the world. It can also be used for scanning items other than archeological artifacts. Potential applications are almost unlimited. Viewers will be able to sort the index using one or more of the data fields in the index. Once item numbers are known for any scans of interest, users may download those models. Once downloaded, scans may be viewed using any of various viewing programs (such as Geomagic Verify Viewer, Cloud Compare or Sketch Fab) which are available for free download. With such viewers, scans may be examined and studied from various perspectives and measurements made on the image. Viewers may even use the downloaded models to create reproductions of the artifacts with 3-D printers which are available at many public libraries, universities and private entities. An important advantage of the scanning lab is that it will facilitate education in the use of this technology. Plans are being developed to offer training and hands-on experience in this technology to interested college students, possibly through fellowships or directed individual studies. Based on the above, it may be seen that the scanning lab allows the Institute to provide a valuable support service to scientists studying the archeological resources of the Florida area; it will allow the development of an on-line museum of artifacts from that area; and it will provide for education in a new technology. Thus, it is a valuable resource for the community and represents an important contribution to science.